Mumbai / New delhi: The developers of the new airports in Bangalore and Hyderabad have been caught on the back foot with domestic carriers cancelling more than 1,300 flights a week due to high fuel costs, less than six months after these facilities opened for business. Such cancellations, which account for some 15% of the traffic handled by the country’s top six airports, are expected to lower revenues and hinder their ability to raise money for modernization and expansion. The new airports are designed to handle an anticipated rise in the number of flights and passengers that the old facilities weren’t geared for. Four of these airports—in New Delhi, Mumbai, Bangalore and Hyderabad—are at various stages of modernization and capacity expansion to handle a combined 100 million passengers a year by 2010, up from about 50 million passengers at present. For instance, the new Bangalore airport, built by a consortium led by Siemens AG, needs money to construct a second runway while the Mumbai airport is upgrading its terminal facilities to handle 16 million additional passengers by 2010. “Since 45% of the airports’ total revenues are aeronautical charges and 50% of that comprise landing and parking charges, there could be an impact of 4-5% on total revenues," said an aviation analyst with a Chennai-based brokerage. Aeronautical charges include landing, parking and navigation fees paid by airlines. The cancellations, he said, would be offset to an extent by a rise in international passengers, but the total decline would still hurt the prospects of both airlines and airports. “The new airports would need approximately Rs24,000 crore in the next few years depending up on the emerging market dynamics," he said. The analyst didn’t want to be named as he isn’t authorized to speak with the media. Isaac George, chief financial officer of GVK Group, which is developing the Mumbai airport, admitted to a drop in passenger traffic for the quarter ending September. “The mismatch was not as expected on traffic. We will have to wait to assess the financial implications of this," George said, without elaborating. He expects the airlines to re-induct their flights with crude oil prices cooling off to about $100 (Rs4,580 today) a barrel from more than $145 a barrel in July. 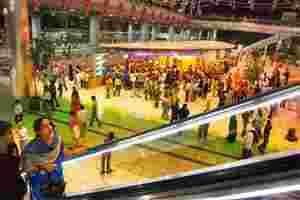 A spokesman for Delhi International Airport Ltd, or Dial, which is being upgraded by the GMR Group, denied any flight cancellations year-on-year. “No, there has been no drop in the number of flights at Delhi airport this year," this person said. Mint had reported on 23 July that the new Bangalore airport was struggling with peak-hour traffic, but analysts say the recent drop in flights is temporary and airports cannot afford to push back expansion plans. The airport business cannot be judged by a short-term phenomenon, said Vikram Limaye, executive director of Infrastructure Development Finance Co. Ltd, the lead finance arranger for GVK for the Mumbai airport expansion project that aims to handle 40 million passengers a year by 2010. “Like any other business, airports also go through circles," Limaye said. “But when you take a consolidated approach for 15 years, there should not be any problem," he said. It is still too early for fresh investments in airports to get hit by the slowdown, said Peeyush Naidu, senior manager at management consultancy PricewaterhouseCoopers. “(Investors) will be looking for sustained trends. If the trends go further then these factors (will be taken) into account," Naidu said, referring to the various operators that are in talks with the consulting firm to build private airports. Some of these projects are for businesses such as cargo and private aircraft, and therefore do not bank on passenger airlines for their revenues, he said.